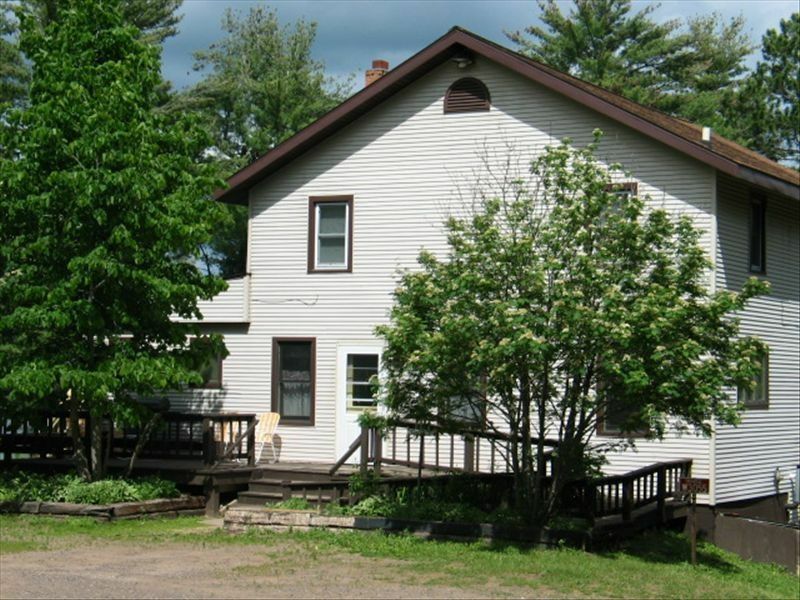 Welcome to the Lemens Lodge on Long Lake - a Sportsman and Family Lodge! This home was formerly the J&J Resort, now converted to a large year-round vacation rental property. It has 4 bedrooms upstairs and additional sleeping options downstairs to accommodate small and large groups. There are 2.5 full bathrooms, Two full baths, on the main level and on the upper level and a 2nd half bath on first floor. In 2017 VRBO changed the booking method making it confusing, Lemens Lodge does NOT use the online booking, You MUST CALL US to confirm a booking. The upstairs layout is 4 bedrooms and a full bathroom. All bedrooms have small tables, chair and dressers. NW Bedroom is smallest with one queen bed. NE Bedroom is medium with two single beds. In addition on the first floor, in a corner (not private) is a daybed with pull out twin to make a full size bed. We also have a futon and pull out couch. This should give you lots of options. The home has a large fully equipped kitchen and washer-dryer. With Three Decks; The front deck for small simple relaxation, The rear deck for the lake view, gathering and grilling, It also has a very large private "icehouse" deck along the lake with awesome views of the lake and the Boy Scouts property across the Bay. The Boy Scouts own 10 miles of undeveloped shoreline which makes this one of the most beautiful lakes in the area. The property has its own private dock and campfire pit. It also shares a convenient fish house to clean your fish. Long Lake is known for it fishing and is the 'Walleye Capital of Wisconsin'. It also has an abundant supply of small-mouth bass, large-mouth bass, crappies and sunfish. There are many restaurants and marinas (providing gas and rental boats) on the lake so that you never have to leave the lake. Off the lake, there are some great restaurants and golfing options. If you like to shop, Stone Lake is only 10 minutes away, Spooner is 20 minutes and Hayward is only 35 minutes away. Hayward always has something going on and its Main Street is loaded with shops, restaurants, its famous candy store and bakery and even a Wine Cave with entertainment. Rice Lake, 30 minutes, provides full services, and large scale stores. Once you arrive, our property manager, will provide you with a Welcome Book that provides details on the property so you can feel right at home and gives you other local restaurant, shopping and recreational activities. Come join us on one of the most beautiful lakes in the area. There is so much time and fun that there are weeks we don't find a need to leave the property, Bring enough boats and equipment, and food and refreshments, Check out the pictures on the wall, Its hard to believe this scenic tree filled resort was once a Farm, the house? the barn in the 1940's the Silo foundation is under the first floor bathrooms. And once a thriving J&J Restaurant and resort of 5 acres, succumbed to changing times. Now it gives us and you an opportunity to enjoy the good life. The rustic curving roads should remind you to slow down your vehicle and your attitude, prepare to enjoy the outdoor and the time together. While not alone, houses are spaced to give your crew space. Calm, tree lined view, across the lake is a forested area used only occasionally by the boy scouts. So enjoy the eagle , loons, and great blue herons. Sloping land to beach, good for swimming and all lake activities, Private deck at waters edge and private dock provided. Also has shared fish cleaning house with sink, running water and supplies. Forced air and electric baseboard. Bed linens and kitchen towels are provided, professionally cleaned before you arrive. NOT PROVIDED: bath & swim towels. Two large new windows 2013- overlooking the lake. And glass doors to the lakeside deck. cooking and baking items in house. Two Tables, one large enough easily for 10+, other easily 6. (3) one TV in family room and two small TV's are located in bedrooms, all connected to cable. In June 2014- Charter went to Digital cable requiring and charging for each separate connection box. On the shelf by Kitchen door. New 2014- 15 x 20 foot DECK Attached to Lake side. Also older deck attached to front side of house. Ramp to Front Door. However the bathrooms are NOT ADA compliant, inside doors are NOT big enough to get wheel chair in. Sorry, it was built in 1950's No special accommodations are available. This property is adjacent to Sam's Place, a small resort. The owners are related to the owner of this rental house and are very friendly and helpful during your stay. The home has its own private large deck at lakeside with its own private dock and fire pit, fire wood is provided free. Not a very nice place. Very dated. Many things in disrepair (air hockey table doesn't work, sliding door wouldn't open). Stayed in winter and nothing was shoveled out. This place is cheap, but still not worth the money. We vacationed and ate at the JNJ growing, so awesome that it feels the same! Always a good time had by all!! This place on the lake is a little slice of heaven. This place is perfect for our group of seven. We will be back! Long Lake, has clear water, great fishing and recreational boating, it has about 10 miles of tree lined shoreline owned by the Boy Scouts of America. Lemens Lodge overlooks the Boy Scouts property across the bay, so you have the beauty of tall pines and undeveloped shoreline. The wildlife and scenery is outstanding.